I love working with parents to support them in developing their relationship with their baby through infant massage. At every class I teach, I see the engagement between parent and baby grow in their own unique ways. This relationship forms the foundations of baby’s future relationships and emotional resilience. In the modern world, we have access to so much information about preventative therapies. And this is one that the research continues to endorse. As a result, I don’t jump out of helicopters to save people, I help them develop their own tools to prevent problems in the first place. It’s an extremely rewarding and privileged role, and this article, taken from the International Association of Infant Massage (IAIM) website, explains the current landscape of child wellness to perfection. The most recent research suggests as many as 20% of Australian babies are experiencing serious risk factors for mental health and other difficulties that can have life-long consequences (Scott, 2011). Many early warning signs go un-noticed, often put down to ‘normal’ differences between babies. However, by the time they are two, 20% of all Australian children will show clinical signs of mental health problems, the vast majority of which could have been prevented (Scott, 2011). before they become serious or entrenched. She could be any one of the half-million babies born to Australian families every year. From the moment she is born, if she can manage to survive (and, fortunately, most babies in Australia do) her second major job is to learn – as quickly as possible what her “world” is like. Am I safe? Do I need to keep my guard up? Can I rely on the people around me? Am I loveable and important? Do I need to protect myself? Is it better to respond with compassion? Or with violence? Evolution has designed her brain to seek out the answers to these questions before she is two, because forming a picture of what the world is like, and who she is, is the best way to ensure survival for the rest of her life. Thanks to organisations like Harvard University’s Centre for the Developing Child, we now have a much deeper understanding than ever before, of how this learning occurs. As it turns out, genetics provide the basis. But it is actually her early experiences that will lay the blueprint for this little girl’s social, cognitive and emotional development into her adulthood. If her parents (and society) could invest in just one thing, one experience that would make all the difference to this little girl’s developing brain, what would it be? Would a set of flash cards give her the best opportunity for lifelong health, well-being and success? Perhaps a book? Or a particular kind of early-learning toy? Surprisingly, it is none of these things. In fact, the experience that seems to matter more than anything else to this little baby’s future does not require a “thing” at all. Instead, the most important experience of all is the interactions she will share with her parent(s). World-famous scientists – such as Dr. Allan Schore and Dr. David Arredondo – have done much to advance our understanding of the vital role of her early interactions. They use the word attunement to describe interactions between parent(s) and babies that appear to have the most profound impact on each baby’s well-being. When parents and babies are attuned (or tuned in) to each other, they use lots of facial expressions, eye contact and physical touch to communicate and interact. This communication helps a baby regulate not only their emotions, but also their vital functions such as heart rate (e.g. Morgan, Horne & Bergman, 2011), hormone levels, and even brain function (Schore, 2006). This little baby’s parents don’t have to interact with her 24 hours a day (that would be exhausting!). Instead, she will experience healthy attunement if she and her parent(s) can communicate together through facial expressions, eye contact, voice and touch in a way that helps keep her in a “good” physical and emotional state, most of the time. This gives her brain the best possible chance of being able to develop all the cognitive, social, emotional, language and personal skills she will need later in life. The good news is that our brains, as parents, are hardwired to tune into our babies in this way. Whether we are rich or poor, young or old, funny or serious, we don’t need to read any books or buy any things in order for attunement to happen. So long as we have the right conditions, our ability to understand and respond to our babies gradually strengthens and grows as we get to know them. Despite this…her chances don’t look so good. Even though attunement should happen fairly easily, we are getting a very frightening picture of how things are going for babies and families Australia. In fact, our most recent research (Scott, 2011) shows as many as 20-25% of all Australian babies and toddlers are already showing clinical signs of pretty serious problems in their early brain development. 1 in 100,000 chance of drowning before her 5th birthday (RLSS, 2010). 1 in 10,500 chance of developing childhood cancer before she turns 14 (AIHW, 2009). 1 in 4 chance of showing risks and signs of (preventable) mental health and brain development difficulties before her 1st birthday (AIHW, 2009, Scott, 2011, ACF, 2006). It comes as a surprise to many people that early challenges and risks don’t discriminate on the basis of how much money or education a family has. Mental health and early intervention specialists are seeing families, from all walks of life, grappling with these difficulties. Early challenges are not caused by “bad parents”. All parents deeply love their babies and want the best for them. But factors such as a premature or stressful birth, health problems, financial stress, or just the normal stress involved in becoming a parent for the first time has the potential to interfere with our brain’s ability to begin tuning in to our babies. One of the most well-known triggers for these early challenges is Postnatal Depression. This mental health issue affects around 1 in 5 Australian mothers, from all walks of life (BeyondBlue, 2011). Even mild Postnatal Depression can dramatically reduce the attunement between a mother and baby, because it makes it difficult for mum to use the full range of facial expressions, eye contact and touch that her baby needs (Weinberg & Tronick, 1998). It is these early problems in parent-baby relationships that, if left unaddressed, dramatically increase the likelihood of life-changing health, mental and social problems – such as language and cognitive delays, adulthood depression, mental illness, drug addiction, violence and risk-taking behaviour. Child abuse and neglect are not causes of these early relationship difficulties, but preventable consequences of them (Vinson & Baldry, 1996). How can we improve her chances? Let’s be honest. It’s tempting to wait until things get really bad. If she experiences some early difficulties in her relationship with her parents…if her parents are under stress or not quite sure how to tune-in to her…it’s hardly likely that she will command much attention. If she finds it difficult to feel comforted by her mum & dad, or she rarely makes eye contact…it’s unlikely that she will make the evening news alongside all the “big” social problems like crime, global warming, homelessness, war or the economic downturn. Chances are, she will be ignored until more serious behavioural problems or mental health issues develop – often many years later. Yet, all of the evidence we have points to one, unavoidable fact: many of these social problems can be reduced – and perhaps even prevented – by investing in early relationships. For many parents, the First Touch Program can make a real and lasting difference. This unassuming and humble program takes five sessions, is low-cost, and is one of the few researched interventions available in Australia directly supporting parents to promote and restore their baby’s early relationships before problems become entrenched. Activities in the program are simple, fun and practical – using infant massage, touch, songs and other interactions that enhance the baby’s and parent’s attunement with each other. Trained facilitators (who, themselves come from all walks of life and backgrounds) adjust the program to the individual needs of parents and babies in each group, ensuring the best possible chance of supporting all families – whether they are already thriving or have particular challenges to overcome. And it works. Research shows this program is the highest quality of its kind (Underdown & Barlow, 2011), that it enhances attunement between parents and babies, and even protects babies from long-term consequences of Postnatal Depression (O’Higgins, 2009; Onzawa, et al., 2001). It’s true. Our people don’t jump out of helicopters and save lives. We don’t dismantle landmines. We don’t find cures. All of the “problems” that we work on will never be seen, because we don’t wait for them to happen before doing something about it. * Costing based on the average, actual cost of baby’s 2 month vaccination. Looking to learn Infant Massage? There are a number of options available for learning infant massage: go to a class, download a You Tube a video, buy a book or DVD. Unfortunately not all materials are created equal, and many lack vital information about communication cues. This is a key element of baby lead infant massage. IAIM has researched, developed and trialled The First Touch Infant Massage program with healthy relationships and well-being of parents and babies foremost as the focus. IAIM provides the only nationally accredited instructor training program in Australia. This gives you reassurance that the infant massage you learn in the IAIM First Touch Infant Massage Program delivers the benefits highlighted in the research. Catherine is a qualified and experienced IAIM Infant Massage Instructor. 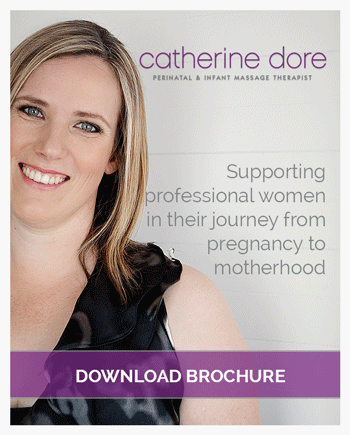 Contact Catherine to find out more about the up coming infant massage programs.